Where Roots And Wings Entwine: Gifts For Baby - Christmas Gift Guide. 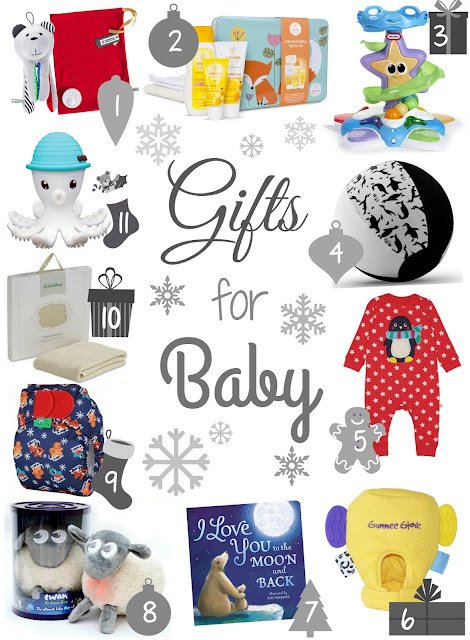 Gifts For Baby - Christmas Gift Guide. 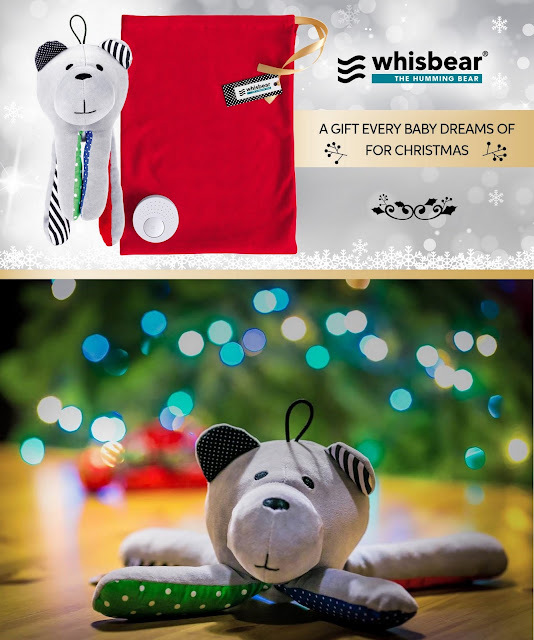 The very clever and innovative Whisbear® - the humming bear which features CRYsensor function that imitates hair dryer sound is top of my wish list of baby gifts. The original Whisbear recognizes baby’s cry, switching on automatically when it does to produce a calming shushing sound that helps settle the baby. After 40 minutes the humming bear automatically switches to stand-by mode, when hopefully baby is settled or asleep. As well as switching on and off automatically the device can also be switched on and off manually thanks to the Soft Start/Soft Stop function. Not only is the bear a great product thanks to the humming feature but it also encourages play and sensory development in baby’s thanks appealing colours and ‘rustle’ design in the bear’s legs and ears. Another appealing feature of the bear is that the bear has magnets hidden in its paws making it easy to be able to attach him to cot’s pushchairs or car seats. The lovely handmade Whisbear’s come in a variety of colours – colourful and citron paw with Minky® fabric, colourful and watermelon paw with Minky® fabric, colourful and turquoise paw with Minky® fabric, and a limited edition red Minky® paw which comes with a luxury red velvet bag with golden ribbon. As well as the Humming Bear, Whisbear also make Swaddle Blankets. Like Whisbear the Humming Bear, their swaddle blanket is designed to help a baby gradually adapt to life outside the womb. The swaddle blankets are made from the highest quality, soft and child-friendly, OEKO-TEX tested materials, and are ideal for reminding little ones of the cramped space when they were in the womb. The beautiful swaddle blankets are available in 2 colours – Grey with Black and White Waves, and Grey with Blue-Green. 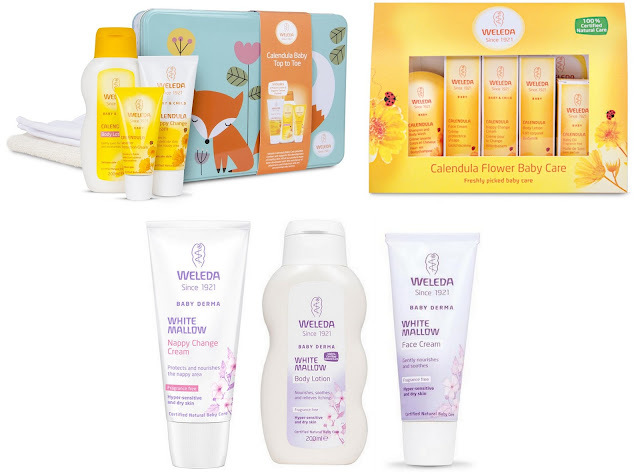 Using the best from nature to help you nurture your baby, Weleda’s baby products are lovely gifts. This 100 % natural bestselling baby skincare gift with organic calendula extract includes 3 best-selling products - Face cream, nappy change cream and Body Lotion along with 2 muslin cloths and an organic cloth flannel, all of which comes in a cute, quirky limited edition gift tin. Treat your little ones to Weleda’s new White Mallow skincare products. The White Mallow Face Cream is a soothing face cream that provides moisture and relieves itching thanks to the precious extracts of organic White Mallow and Pansy. The White Mallow Body Lotion provides intensive care moisturising, cooling and soothing. The White Mallow Nappy Change Cream is a protective cream that promotes the development of healthy skin in the nappy area thanks to the carefully selected formulation of beneficial ingredients with precious organic White Mallow extract soothing hypersensitive skin. Brand new from Little Tikes is their exciting new Lil’ Ocean Explorers range - designed to discover and celebrate your baby’s milestones! These eight adorable sea creatures help develop motor skills, coordination and confidence as well as being hours of fun for your little adventurers. Having spent years in development, Little Tikes has created this range to offer parents a fun filled toys that helps them to educate and excite their little adventurer. With products from just £8.99, it’s sure to be a firm favourite this Christmas. We especially love the 3-in-1 Adventure Course that helps develop and entertain baby through 3 key developmental milestones – sitting, crawling and standing, Catch Me Crabbie that features motion sensors to detect baby approaching to begin moving side to side clapping its claws and playing music, and Stand ‘N Dance Starfish which encourages baby to create music and dance along. 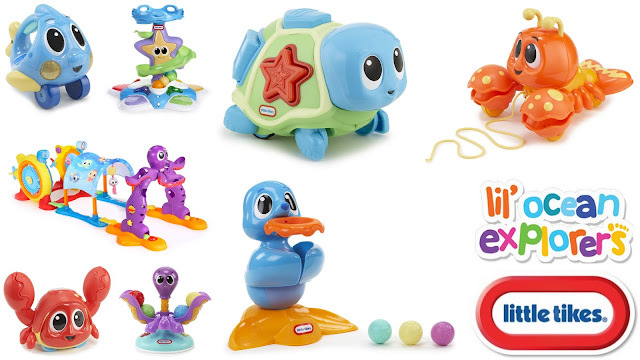 Other brilliant toys in the range are Dunk ‘n Juggle Seal, Pull ‘Chatter Lobster, Crawl n’ Pop Turtle, Ball Chase Octopus , and Push n’ Glow Fish. The BUBABLOON is an innovative product that makes the joy of balloon play simple, safe and fun. The clever product transforms a normal balloon into a durable, washable, reusable balloon ball toy. For endless hours of balloon fun in a safe way you insert a deflated, standard size balloon into the BUBABLOON, blow up and tie the balloon as normal, tuck the knot inside the specially designed flap and then play, play and play some more! Playful penguin print, poplin cotton and felt for a Christmas present which will provide hours of fun. The Black & White print is also brilliant for baby’s eyesight development. Cord, felt and poplin cotton combined for a multi-sensory sensation. All 100% poplin cotton which work with any standard balloon. There’s nothing like baby’s first Christmas and parents will love choosing their festive outfits. Frugi, the UK’s leading organic childrenswear brand, have a gorgeous selection of Christmas clothes, which make the best newborn and baby gifts. This gift set is a perfect gift for your little one or the arrival of a new baby! The Frugi branded box includes a fully lined organic cotton romper with a colourful applique on the front, with a matching dribble bib and a pair of coordinating cosy socks. All are made from 100% organic cotton, warm and soft on babies' skin. Practical, super soft and 100% organic cotton! This romper has a fab envelope neck and poppers on the inside of the leg for easy changing. The rib cuffs and lining on the inside front.panel provides extra comfort. With fun applique on the front. A beautifully soft, organic cotton babygrow. Fully poppered for ease of changing with integrated scratch mitts. The multi-award winning Gummee Glove is a great gift for little ones as it is designed to help little ones help themselves. The mitten is made to fit babies from 3 to 6 months. It's perfect for youngsters who are too young to hold a teething toy on their own. No more problems with toys falling on the floor or out of the pushchair. The Glove attaches to baby's hand with a velcro closure at the wrist. It has colourful, biteable side tabs, teething tabs with raised silicone dots to massage tiny gums, and a detachable heart-shaped silicone teething ring that can be heat-sterilised or refrigerated. The Gummee Glove is machine-washable in the handy laundry bag that comes with every purchase, this doubles up as a travel bag. * The Very Lazy Ladybird - a best-selling storybook that comes in a presentation box with a very cute, and very lazy Ladybird cuddly toy. * My First Touch and Feel: Farm - an appealing touchy-feely book that little ones with love with the tactile texture engaging their senses. * I Love You To The Moon And Back - a lovely book that celebrates the love between parent and child. The chunky board book is great for little ones too. * Twinkle Twinkle Little Star - a gorgeous collection of favourite nursery rhymes, and To *Baby With Love which is a beautiful baby journal with room to record special moments and milestones in your baby’s first year. The heartbeat and womb sounds are actual recordings, not computer generated and these have been proven to have a calming effect with even the most unsettled baby. Vacuum cleaner, rain and harp recordings together with the womb sequence provide 4 different calming 'pink noise' sound tracks to choose from and all are combined with mum's resting heartbeat to provide extra reassurance. The sounds, which play for 20 minutes, are all recorded at the low base frquency the baby can predominantly hear when in the womb - 125Hz pink noise range - which is why they work so well at settling 'little ones' off to sleep. For babies under 12 months ewan can be placed next to moses basket or attached to cot bars. He has proved to be loved by children of all ages, from newborn to older children up to around 7 years of age. 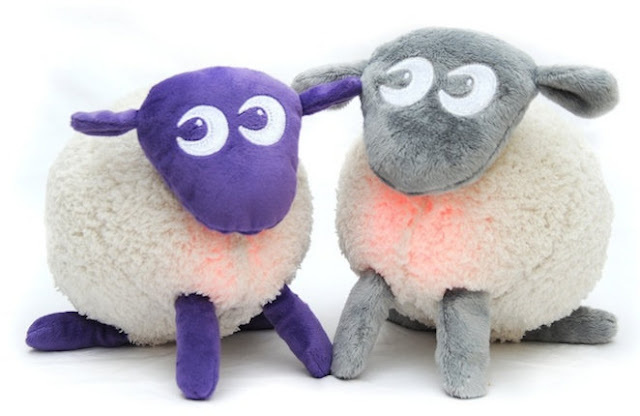 The multi-award winning sleep aid is available in original Purple of the new Grey fleece. This baby comforter has supersoft snuggly plush and silky fabrics, knotted legs for fingers to explore and Velcro tail to secure a dummy or teether and help keep it close by. Better still the snuggly® fabric can easily absorb mum or dad’s comforting scent to provide extra reassurance and security for baby as they drift off to sleep. The ewan snuggly® is just the right size for tiny hands to hold and is perfect for cuddling at any time of day. It is available in both purple and grey fleece. Have yourself a very fluffy Christmas with TotBots’ limited edition nappy. With a midnight blue background, this nappy is decorated with baby Rudolph, robins and gingerbread men, all taking a sleigh ride in the snow. We also love their nursery rhymes inspired designs – Hickory Dickory, Humpty Dumpty, Incy wincy , and Sixpence. The iconic baby blanket by The Little Green Sheep is loved and adored for its stunning quality, simple knit design and intricate finish. Made with certified organic cotton that moulds beautifully around your baby’s body to create a secure, comfy and breathable environment this would be a lovely gift. The beautiful baby blanket is available in a range of colours; Eco-White, Blossom Pink, Natural, and Duck Egg Blue. 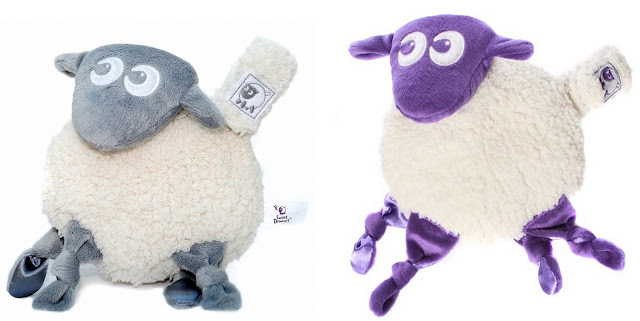 Mombella teether’s are great gifts for little ones as they are safe for little ones to munch on, being European EN71 certified: safe for children age 0-3 years. Made from eco-friendly food-grade silicone they are free of BPAs, Phthalates, cadmium, lead, latex or any harmful toxins. They are also FDA-approved Food grade silicone: Dishwasher safe for sanitizing in high temperature. They are a non-choking hazard design which aids in the eruption of new teeth. They provide soothing relief for your baby thanks to the silicone which has a soft yet firm texture that helps reduce drooling and provide teething relief. It can also be frozen or cooled to help your baby's itchy sore gums. 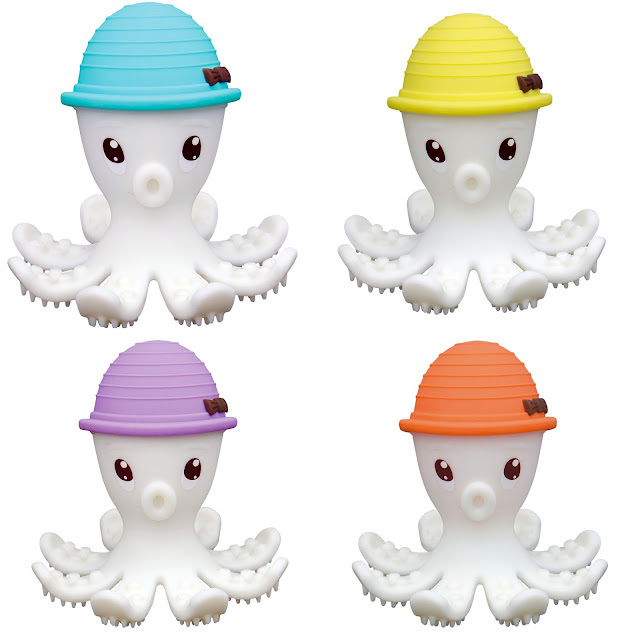 The Octopus teether is the world’s first 3D hollow silicone teether toy. The teether has multiple textured surfaces to chew and touch. Not only is it a teether but it also a toothbrush. 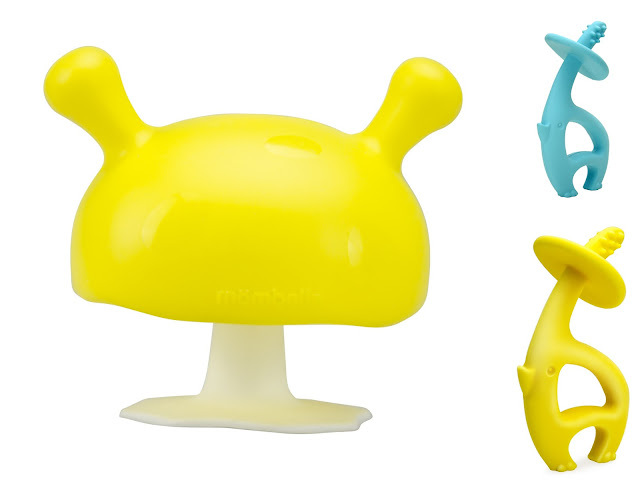 The hollow, light design is ideal for little hands to hold. It is dishwasher and freezer safe. Unlike rubber teethers it can be sterilized. 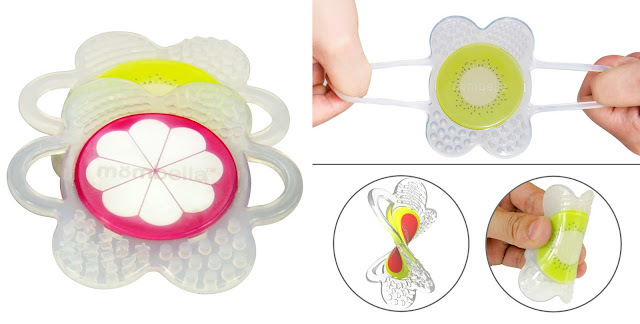 The Flower Fruit teether is super flexible yet durable, and boasts the safe level of safety and teething prowess as the octopus. Mombella’s upcoming designs are bright and colourful. What are you getting your baby this Christmas?